W. W. Norton & Company, 9780393080841, 250pp. 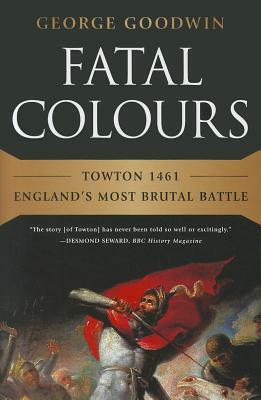 Variously described as the largest, longest, and bloodiest battle on English soil, Towton was fought with little chance of escape and none of surrender. Yet, as if too ghastly to contemplate, the battle itself and the turbulent reign of Henry VI were neglected for centuries. Combining medieval sources and modern scholarship, George Goodwin colorfully re-creates the atmosphere of fifteenth-century England. From the death of the great Henry V and his baby son's inheritance first of England and then of France, Goodwin chronicles the vicious infighting at home in response to the vicissitudes of the Hundred Years War abroad. He vividly describes the pivotal year of 1450 and a decade of breakdown for both king and kingdom, as increasingly embittered factions struggle for a supremacy that could be secured only after the carnage of Towton. Fatal Colours includes a cast of strong and compelling characters: a warrior queen, a ruthless king-making earl, even a papal legate who excommunicates an entire army. And at its center is the first full explanation for the crippling incapacity of the enduringly childlike Henry VI--founder of Eton and King's College, Cambridge. With a substantive and sparkling introduction by David Starkey, Fatal Colours brings to life a vibrant and violent age.